Sauté onions, peppers and garlic in olive oil. Add salt and red hot pepper flakes/fresh chili pepper to taste. 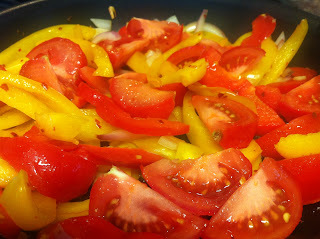 Once peppers start to brown (after about 5-7 minutes) add tomatoes and continue to sauté. Total sautéing time is about 10-12 minutes. Next, add your eggs to the onion/pepper/garlic mixture (equidistant from one another), and with your spatula gently distribute the whites of the eggs over the vegetables. 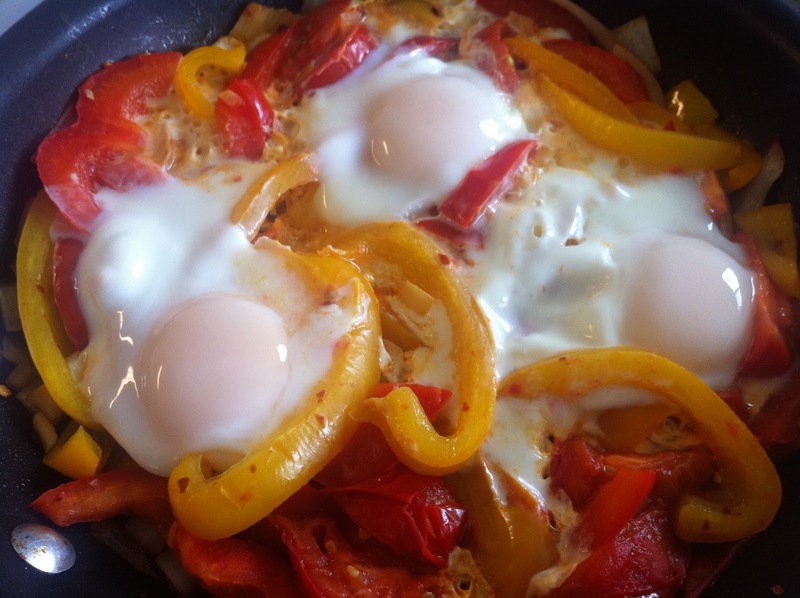 Cover with lid and cook until eggs reach desired level of doneness. (I like my eggs runny, so I don’t cook them for too long J). Enjoy this meal for breakfast, lunch or dinner and serve garnished with some fresh basil along with a piece of whole wheat pita!